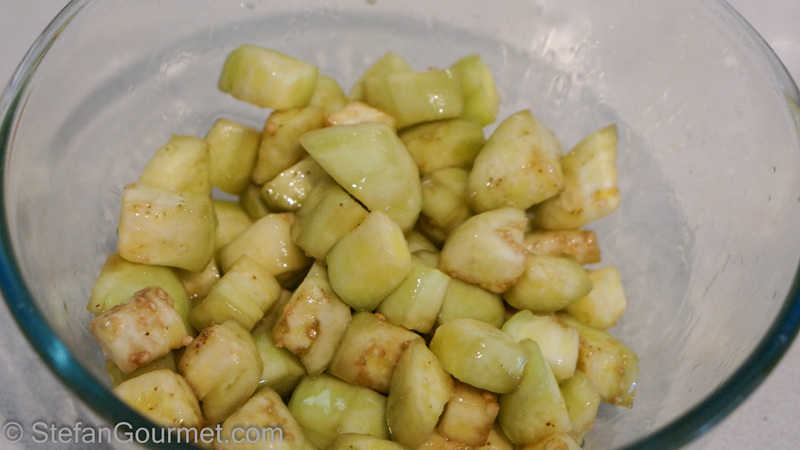 The skin of eggplant can be quite tough, so in a preparation like this I like to peel the eggplant. With a vegetable peeler that is quite easy to do. Dice the eggplant (into about 2 cm or 3/4 inch dice) and put in a colander. Season liberally with salt, shake a few times, season with more salt, and shake again. Put a plate on top of the eggplant and something heavy on top of that, and wait for about an hour until the eggplant has released a lot of its juices. This makes the eggplant easier to cook and it will lose some of its bitter flavor. You could also skip this step altogether. 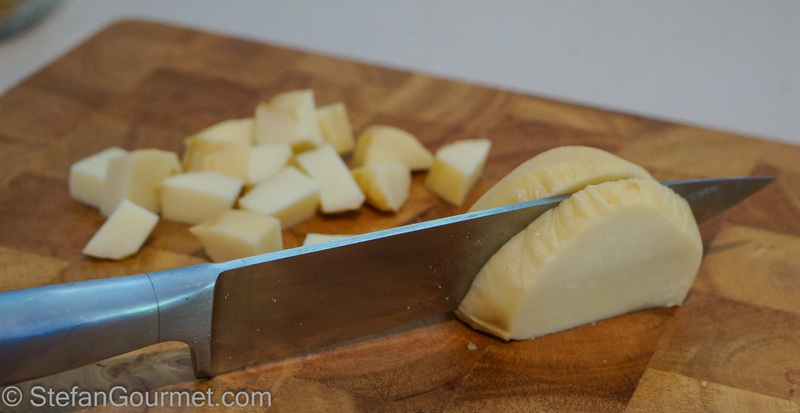 Meanwhile, dice the scamorza and cut the cherry tomatoes in halves (check out this post for a trick to do that very quickly). Once the eggplant has released its juices, pat the diced eggplant dry with paper towels. There is no need to rinse it first (if you didn’t go overboard with the salt). 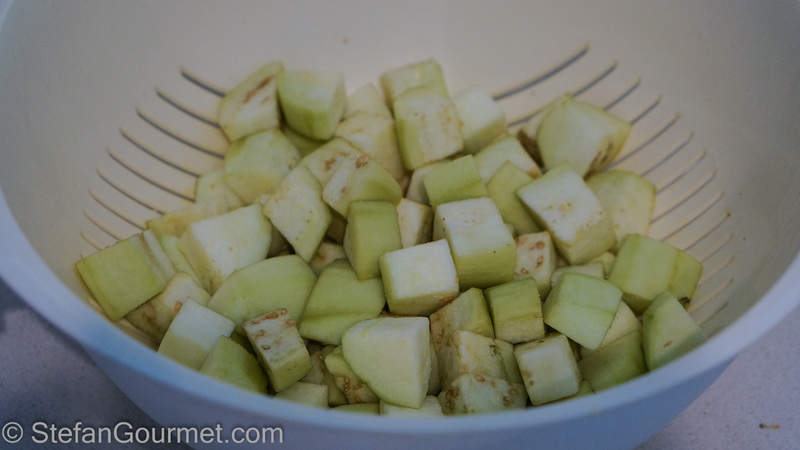 Put the eggplant in a bowl and add extra virgin olive oil. 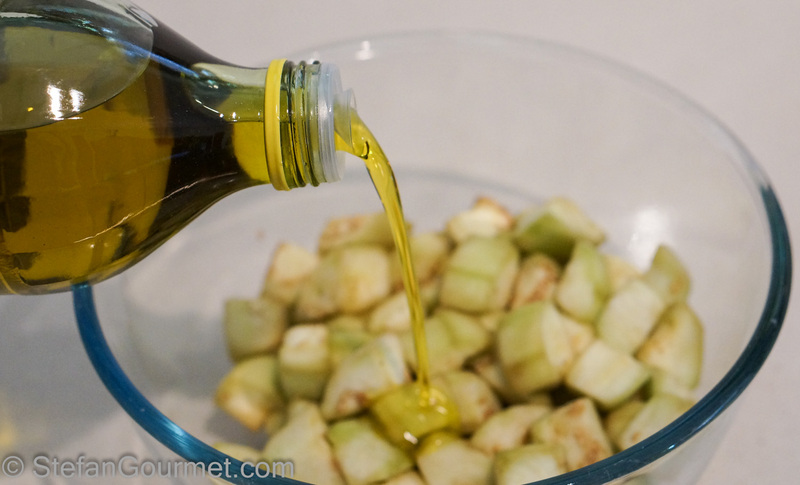 Toss to cover the eggplant with the oil. 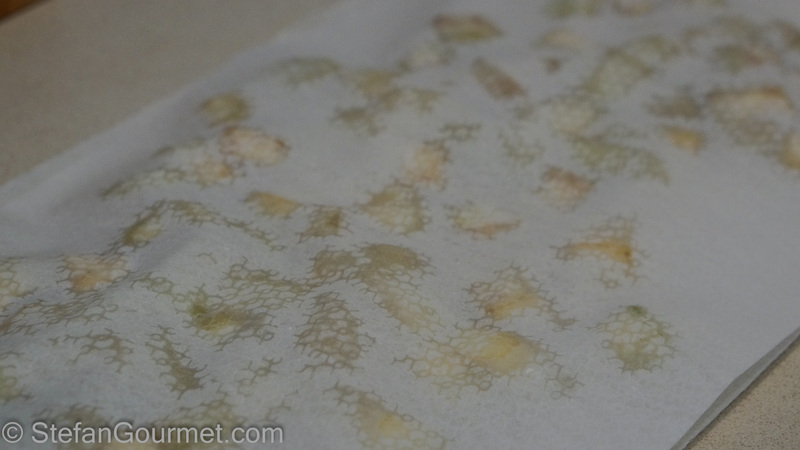 Arrange the eggplant on a baking sheet lined with parchment paper. 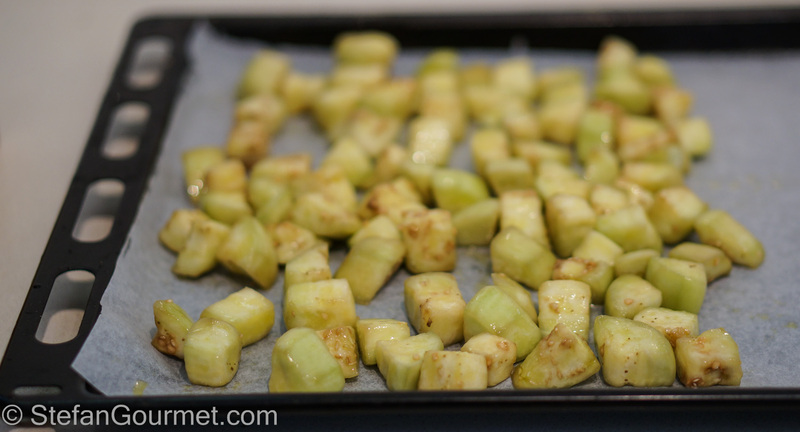 Roast the eggplant for about 15 minutes at 225ºC/440ºF (fan forced). 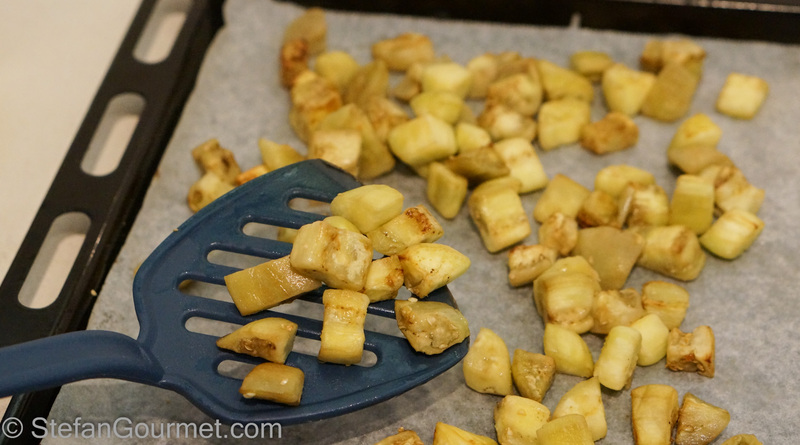 Take the baking sheet out of the oven and turn the eggplant so both sides can cook evenly. 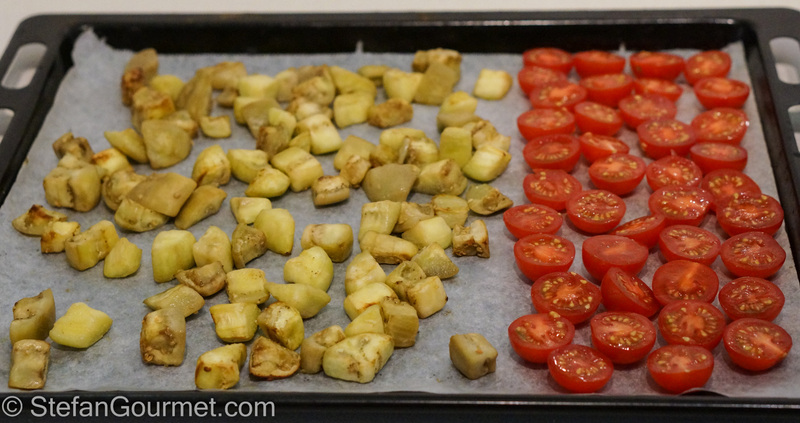 Arrange the halved cherry tomatoes, cut side up, on the same baking sheet. 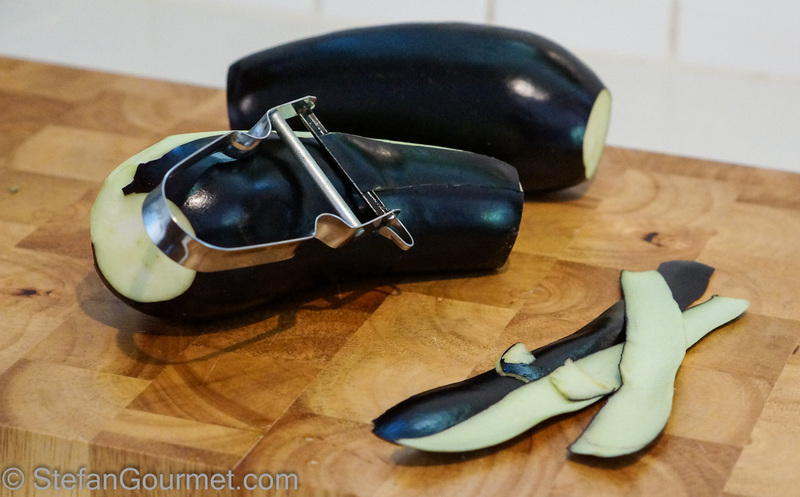 Return the baking sheet to the oven and roast at 225ºC/440ºF (fan forced) for another 10-15 minutes or until the eggplant starts to brown and the tomatoes start to wrinkle. Meanwhile, cook the penne in boiling salted water according to package instructions. Drain the penne when they are still al dente. 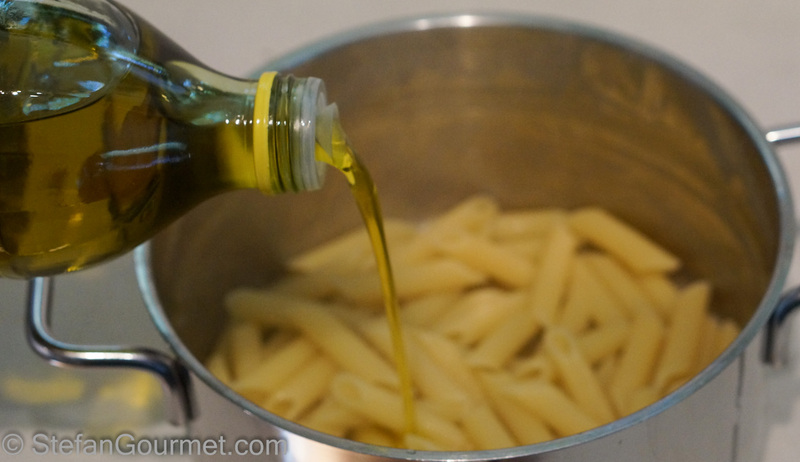 Toss the penne with some extra virgin olive oil so they won’t stick together. Since I was cooking for two, I decided to bake the two portions on individual plates. You could also bake everything in a single large oven proof dish. Put the oiled pasta in the baking dish (or arrange it on oven proof plates). 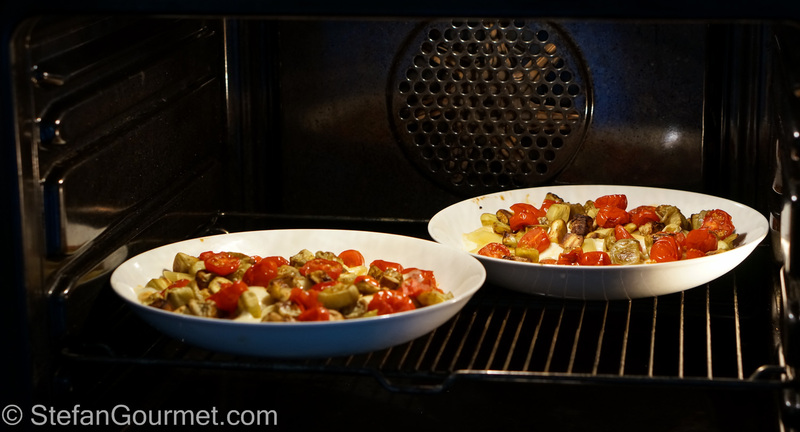 Once the tomatoes and eggplant are done roasting, add them to the pasta as well. 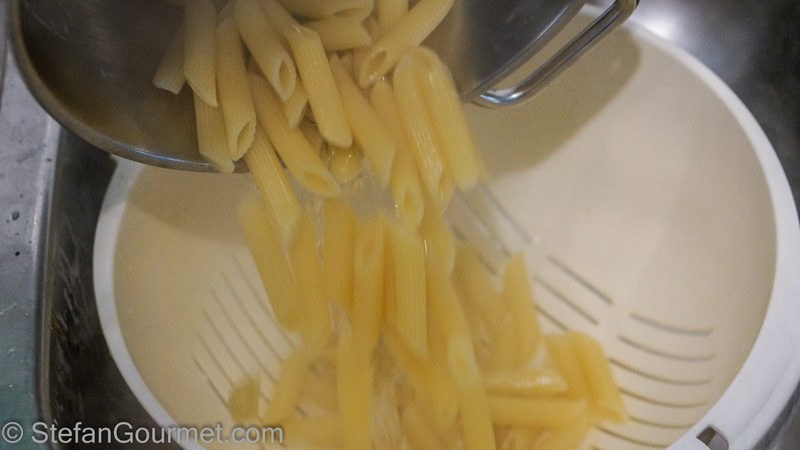 Now bake the pasta in the oven for about 5 minutes or until the cheese has melted and starts to bubble. Sprinkle with basil chiffonade and serve at once. We enjoyed this with a red Sancerre, a pinot noir based wine from the Loire valley that, in this case, was unoaked, fruity, and smoky. The latter two qualities are important to go with the scamorza (smoky) and tomatoes (fruity). 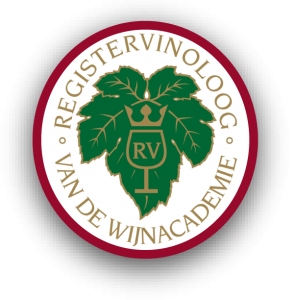 A pinot noir (or Spätburgunder) in a similar smoky fruity style from another region such as Germany, Alsace, New Zealand would also be great. 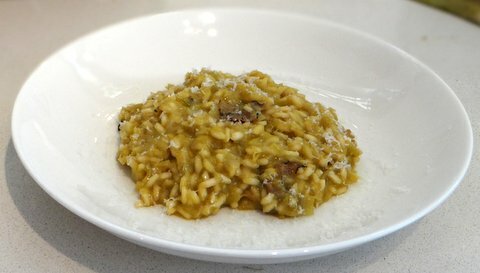 Two years ago I made truffle, shallot and leek risotto, inspired by a dish by Osteria Francescana in Modena. I then made it with dried truffle, but is of course an ever bigger treat with a proper fresh truffle. Stefan, you have an amazing range of dishes. From the hugely complex and sophisticated to the very simple and delicious. I love this one. Thanks Jenn, for visiting and taking the time to leave such a nice comment.